Nov. 4 1879 - Aug 15, 1935. 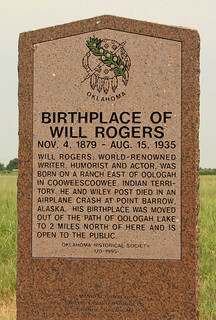 Will Rogers world renowned writer, humorist and actor, was born on a ranch east of Oologah in Cooweescoowee, Indian Territory. He and Wiley Post died in an airplane crash at Point Barrow, Alaska. His birthplace was moved out of the path of Oologah lake to 2 miles norht of here and is open to the public. Oklahoma Historical Society 170-1995. Oologah, Oklahoma. North from Oologah High School on US-169 0.5 miles, Turn right (east) onto E 380 Rd/Birth Place Rd W/Ew38, go 2.2 miles.